Sometimes it’s not always easy to get enough EFAs (essential fatty acids) from the diet, particularly if you don’t eat fish very often. Mumomega contains a blend of essential fatty acids aimed at supporting the dietary intake of particular fatty acids occurring during pregnancy. Unique supplement combining specific Omega-3 and Omega-6 long-chain fatty acids that are important before, during and after pregnancy for both mother and baby. Up to 30% of the brain and eye is made of long-chain polyunsaturated fatty acids. Docosahexaenoic acid (DHA) has a structural role in the brain and in the retina. Foetal and infant development is characterized by a high level of formation of new cells. Long chain polyunsaturated fatty acids are an integral part of the membranes surrounding these new cells. Supplementing with equazen eye q mumomega® is a convenient way to ensure input of these important nutrients, thereby helping to ensure the mother has an adequate intake. However, oily fish can contain low levels of pollutants that can build up in the body. For this reason there are recommendations for the maximum number of portions of oily fish we should be eating each week (a portion is about 140g). When you're trying for a baby, pregnant or breastfeeding eating fish is good for your health and the development of your baby, but you need to avoid some types of fish and limit the amount you eat of some others. The FSA (Food Standards Agency) guidelines suggest a maximum of two portions a week of oily fish including tuna, but not to eat shark, swordfish or marlin - because these fish contain more mercury than other types. DHA rich fish oil, Evening Primrose Oil, Capsule shell (gelatin, glycerol, purified water), virgin Evening Primrose Oil, Natural Vitamin E, (as d-alpha tocopherol derived from IP soya). 1 EU recommended daily allowance 23% RDA +∞TE = d-alpha tocopherol. DHA, or Docosahexaenoic Acid. This is an Omega-3 essential fatty acid that is a component in the structure of cell membranes of the eye and brain. In fact, up to 30% of the dry weight of the brain is made up of Omega-3 and Omega-6 essential fatty acids, which typically comes from oily fish. AA, or Arachidonic Acid. This is an Omega-6 essential fatty acid that can play both structural and functional roles in the brain. In the diet, AA is usually derived from meat and dairy products, as well as cereals. EPA, or Eicosapentaenoic Acid. Another Omega-3 fatty acid, EPA is thought to play more of a prominent role in the function of the established brain than the structural fatty acid DHA. GLA, or Gamma Linolenic Acid. This Omega-6 essential fatty acid is known to also have anti-inflammatory actions, and may help to regulate hormonal balance. We opted for an oil specification that used high-grade marine and botanical oils to deliver the key Omega-3 and Omega-6 essential fatty acids. The Omega-3 source has been modified to concentrate the DHA to a very high level, as well as elevated amounts of AA. The Omega-6 source is virgin evening primrose oil. In terms of intake, we recommend that pregnant and lactating women take at least 300 mg of DHA a day. We also suggest infants take at least 100 mg of DHA a day. That’s why we developed Equazen eye q baby. Everyone needs essential fatty acids (EFAs), but if you're planning to have a baby, it's even more important you make sure you are getting enough of these essential nutrients.If you are not getting adequate EFAs through your diet, taking just 1 capsule a day of mumomega will ensure that you are maintaining your intake. Taking essential fatty acids is still important if this is not your first pregnancy, to ensure you continue to maintain your essential fatty acid levels. 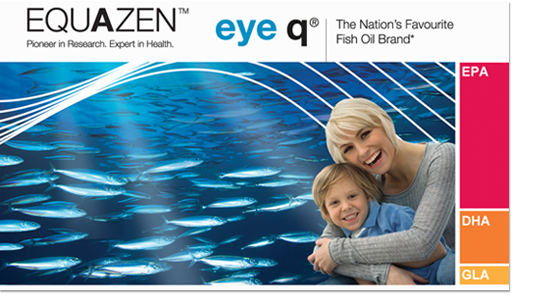 Equazen is a specialist supplier of Omega-3 and Omega-6 essential fatty acids made from high-grade marine and botanical oils. mumomega provides long-chain fatty acids andnatural antioxidants, but the formulation is otherwise free of any additives, flavourings or synthetic compounds. We only use natural-form oils, keeping them in the form of triglycerides. Synthetic ethyl esters are not considered, as these substances are in a form that is less suitable for the body to absorb. The Omega-3 fish oil has been concentrated, but the Equazen process involves deconstructing the fatty acids, and then reassembling them into natural form triglycerides.